At the end of every year most of the world is reminiscing about the past year. It is sad to think about those who have left this world. Instead of crying over our loss; let’s take what we learned from those folks and make our affirmations for the New Year. My grandmother passed away in October. She lived to be almost ninety-eight years old. The one thing she always taught us was to be nice. She would tell us that if you can’t say anything nice then say nothing at all. That is a very hard lesson to learn but once you do, your life becomes so much easier. We have all mourned the loss of the precious children from Sandy Hook Elementary School. Each one of those parents kissed their children goodbye that morning not knowing that it would be the last time. This broke my heart for all of us. It is so important that we not only tell our family how much we care for them but that we show them. With our busy life-style we get caught up in the chaos! This stress causes us to be short with our family and with ourselves. We beat ourselves up when we make mistakes. Our perfectionism causes us to be our own worst enemy. This has got to stop! There is a Bible verse that says, Let all things be done decently and in order. For me this means that things need to be done and they don’t have to be perfect. The “order” is talking about routines. Take your daily habits and put them into three step routines. This gets things done. These simple three step routines will help you to release the stress that causes you to be mean to yourself and others. Write them down on Post-It Notes and place them around your home. This will help you to dance through you day with joy! My goal for us is to be kinder to ourselves, to our family, in text, and on Facebook and Twitter. Being kind in thought, word, and deed will make this world a better place 2013! I have been working on a motto for 2013. Here is what I have come up with; Words can be kind or mean; the choice is yours in 2013! Please take my words to heart and let’s make 2013 the year of kindness! 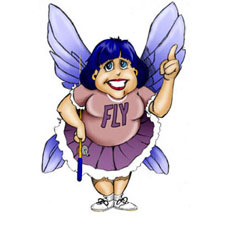 For more help getting rid of your clutter and CHAOS, check out Marla Cilley’s website and join her free mentoring group at www.FlyLady.net, or read her book, Sink Reflections published by Random House. Copyright 2013 Marla Cilley. Used by permission in this publication.